Rhinestones & Gemstones come in all shapes and sizes, and we have settings available to fit all of them. Stone settings are pronged ornaments like NAILHEADS, but are functionally designed to hold a stone in place. Stone settings are of two types, Rim settings & Tiffany settings. Rim Settings are placed over the stone, and frame the stone. The rim can be plain in appearance or engraved. Tiffany Settings are less visable, only the prongs show. They are like an inverted nailhead, the prongs pierce through the front of the material, the stone is placed inside, and the prongs close over the stone and hold it in place. 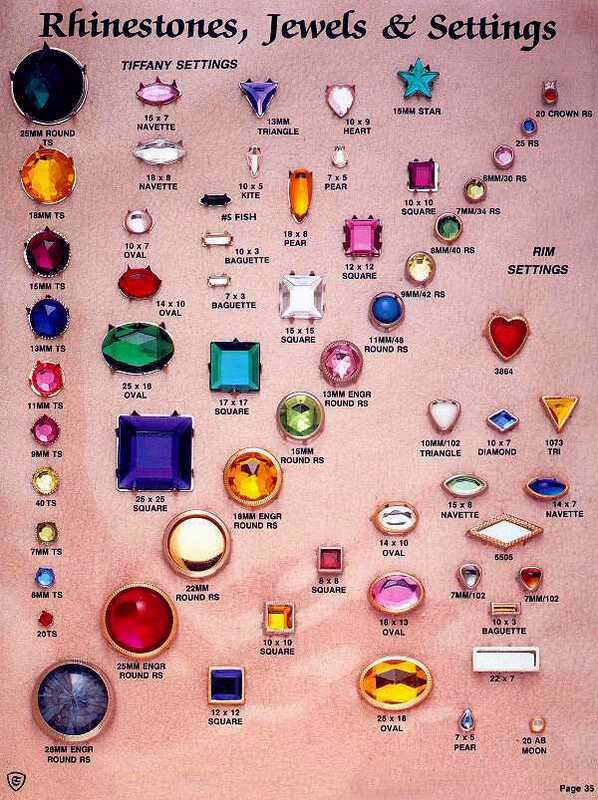 Below are examples of some rim and tiffany settings shown with stones. We have many other shapes & sizes available.